Morning shocker... My morning routine is to sit down with my first cup of tea, fire up the computer, and open a folder full of news bookmarks in tabs. 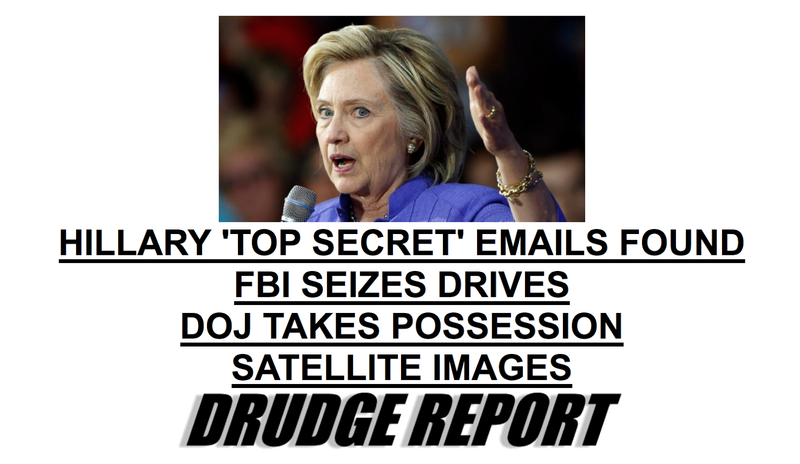 The first site that pops up is the Drudge Report, and this morning here's what I saw (at right). Reading more deeply, I see that Hillary has turned over her email server (you mean that thing hasn't been dissolved in acid?) and a thumb drive with (allegedly) all her emails on it. Aides are being investigated. The investigation is circling her, and tentative jabs directly at her are starting to happen. Ordinarily I'd dismiss most of this as exaggeration and wishful thinking on the part of the interpreter. But ... I can't imagine Hillary would turn over that evidence unless (a) she was forced to, or (b) she had “cleaned” it somehow. The (b) scenario would almost certainly lead to even worse problems for her, though, as it's extremely unlikely that they could actually clean up that email server without leaving traces of what they did – and a blatant cover-up like that would take down even Hillary, I think. So I think the most likely scenario is (a): she was forced to. What would force her? The only thing I can think of is the imminent threat of actual charges or arrest. “They” (the DOJ and FBI) must have the goods on her.